The assignment for day three of Knitting and Crochet Blog Week is to write about someone in fiber crafts that inspires you. "Knitting is where I give the wild woman inside of me free rein. If she wants to be the wise woman as well, that's fine; if not, also fine. I no longer care that my kitchen cupboards are stuffed with yarn, and my closets with half-finished projects ... At this point in my life I say: Judge me if you dare." - Susan Gordon Lydon, Knitting Heaven and Earth. One of my heroes is Susan Gordon Lydon, author of Knitting Heaven and Earth, which I credit for making me fall in love with knitting. 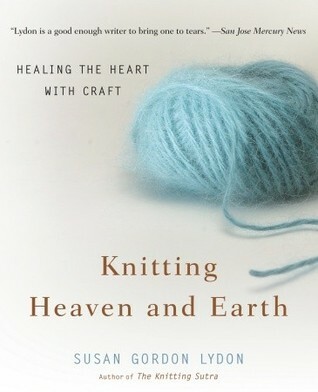 It is a deeply spiritual, moving book about Susan's love of knitting and how it was almost like a wise, supportive companion accompanying her on a journey of love and loss. Her writing is beyond superb; this is one of the few books I've read multiple times and plan to read again and again. Susan was one of the founding editors of Rolling Stone magazine and the author of The Knitting Sutra and Take the Long Way Home. She died from cancer in 2005, the same year Knitting Heaven and Earth was published. To read more about Susan's accomplishments, her colorful life, and the challenges she faced, see this article from SFGate. Lovely. I shall have to read the book. That looks like a great book, I'll definitely having to keep an eye out for it. So touching, that books sounds like a good read! I am definitely getting hold of this book. Thank you for sharing in such a beautiful way. A moving endorsement. I'll add it to my list. Nice post, I may have to read one of her books. Oh man, I had no idea that she died. :( I do enjoy her books. I haven't heard of this book before, but will definitely look out for it. Thank you. Thanks for introducing me to this book. I plan to order it. It looks beautiful, and your blog is wonderful, too. Oh wow. I love how knitting has helped others through times of challenge.